Our web-based Confined Space Entry training course provides the major areas of employee training required by the regulation. This course was created specifically for OSHA's Permit Required Confined Space Regulation (29 CFR Part 1910.146). Because of OSHA's broad definition of "Confined Space", this course will be useful to a number of different types of facilities, including manufacturers, utilities, petroleum and chemical industries, hospitals and many others. We offer a free preview of our web-based training course. Simply register for free on our Learning Management System. Many sites contain areas that are considered "confined spaces" because while they are not necessarily designed for people, they are large enough for workers to enter and perform certain jobs. A confined space also has restricted means for entry or exit and is not designed for continuous occupancy. Confined spaces include, but are not limited to, tanks, vessels, silos, storage bins, hoppers, vaults, pits, manholes, tunnels, equipment housings, ductwork, pipelines, etc. OSHA uses the term "permit-required confined space" (permit space) to describe a confined space that has one or more of the following characteristics: has the potential to contain a hazardous atmosphere; contains material that has the potential to engulf an entrant; has walls that converge inward or floors that slope downward and taper into a smaller area which could trap or asphyxiate the person entering; or contains any other recognized safety or health hazard, such as unguarded machinery, exposed live wires, or heat stress. 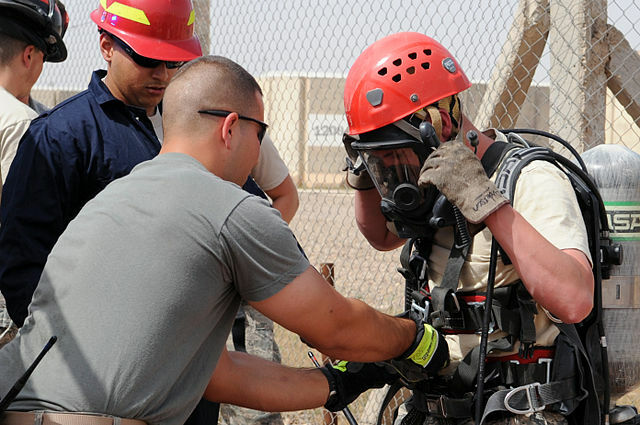 manhole entry during a confined space drill at Joint Base Balad, Iraq, April 5. Any worker who may potentially operate in a confined space as defined in the paragraph above, will need to have some form of confined space training, depending on the level of work needed. Some examples of workers who may need confined space training include firefighters, construction workers, maintenance technicians, building engineers, lab technicians, welders, pipeline workers, HVAC technicians, emergency response personnel, and others. Injuries and fatalities involving confined spaces occur frequently and often involve successive fatalities when would-be rescuers succumb to the same problem as the initial victim. About 60% of the deaths involve would-be rescuers and more than 30% of fatalities occur in a space that has been tested and found to be safe to enter. One example was in 2006 at the decommissioned Sullivan Mine in British Columbia, Canada when one initial victim and then three rescuers all died. Accidents in confined spaces present difficult challenges and are often catastrophic, such as the Xcel Energy Cabin Creek Fire in 2007. In 1999, North West OHS released a study of confined space fatalities based on reports from the Occupational Safety and Health Administration (OSHA), National Institute of Occupational Safety Health (NIOSH) and the Mines Safety and Health Administration (MHSA) with a breakdown of their causes. Researchers believe that the following numbers are only a fraction of the fatal confined space accidents that actually occurred as many locations are not initially identified as confined spaces, OSHA reports did not include non-hazardous confined space fatalities in their studies prior to 1982, NIOSH still do not include non-hazardous confined space fatalities in their studies and many American states do not note the presence of confined spaces in fatality reports submitted to OSHA. Fire and Explosion (OSHA 1982a): 50 confined space incidents from 1974 to 1979 with 76 fatalities. The majority of incidents were caused by worker error or faulty equipment. Lockout-tagout (OSHA 1982b): 83 confined space incidents from 1974 to 1980 with 83 fatalities. This category covers conveyor belts and machinery on the factory floor etc. 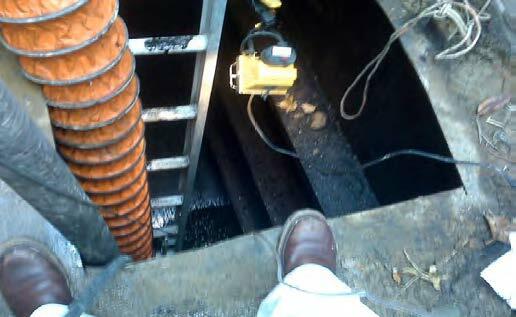 that are not generally considered confined spaces, but which satisfy the criteria for a confined space. Grain Handling (OSHA 1983): 105 confined space incidents from 1977 to 1981 with 126 fatalities. Toxic and Asphyxiating Atmospheres (OSHA 1985): 122 confined space incidents from 1974 to 1982 with 173 fatalities. Welding and Cutting (OSHA 1988): 217 incidents from 1974 to 1985 with 262 fatalities. OSHA reports of welding and cutting deaths do not record whether or not an incident has occurred in a confined space, it is estimated that 22% of the incidents were in a confined space. Shipbuilding & Repair (OSHA 1990): 151 incidents from 1974 to 1984 with 176 fatalities. OSHA reports of shipbuilding deaths do not record whether or not an incident has occurred in a confined space, it is estimated that 36% of the incidents were in a confined space. Mining (MSHA Report 1988): 38 confined space incidents from 1980 to 1986 with 44 fatalities. According to data collected by the U.S. Department of Labor, Bureau of Labor Statistics, Census of Fatal Occupational Injuries program, fatal injuries in confined spaces fluctuated from a low of 81 in 1998 to a high of 100 in 2000 during the five-year period, averaging 92 fatalities per year. entry. A guardrail would also be necessary to protect workers from potential falls. — Use the same equipment. — Run the same tests. — Even work with the same crew. • In many situations these hazards can knock you out in a heartbeat. — Because of the dangers, OSHA created the Permit- Required Confined Space Regulation. • Confined spaces are large enough for a person to enter, but access is physically limited or restricted. — They are large enough to work in. — But are not designed for continuous use. — Hazardous atmospheres such as those containing flammable or toxic gases and vapors. — Atmospheres with too little or too much oxygen. — Tight areas that could trap or suffocate workers. — Spaces that contain materials which can engulf people. • The best way to avoid these hazards is to bring the work outside the confined space. — Unfortunately, this is not always possible. • Facilities must set up and use written "Permit Space Entry Programs" to regulate entry into confined spaces. — Whenever there is a potential for danger, a written Entry Permit must be issued before work inside can begin. — A Written Permit is required for entry. — Or the Space is completely off limits. — Determining if acceptable "entry conditions" are present at a Permit Space. — Authorizing, overseeing and terminating entry operations. • There are three basic atmospheric tests that must be conducted in a confined space. — They must be done in a specific order. — First, to determine the oxygen content. — Second, to detect the presence of flammable gases, vapors and dusts. — Third, to identify toxic contaminants. • The first test is to measure oxygen content. — If it is below 19.5%, a person can't breathe in enough oxygen to do physical work. — A level above 23.5% significantly increases the chance for a spark or other ignition source to cause a fire or explosion. • The second test deals with gases, vapors and dusts which can form flammable or explosive atmospheres. — This occurs when gases, vapors or dusts reach concentrations greater than 10% of their lower flammable or explosive limit (also known as LEL). — If these build up beyond their LEL's, the area can become hazardous. • Combustible dusts can also be a fire or explosion hazard. — If dust obscures vision at a distance of five feet or less, it should be considered above its LEL and, therefore, dangerous. • The third atmospheric test identifies toxic gases or vapors in the air of a confined space. — Breathing these substances can cause illness or even death. — Carbon monoxide and hydrogen sulfide are the two most commonly encountered. — It is extremely important to detect leaks or build-ups of any gases before they can cause harm. • Even after initial testing has been done, periodic testing of the atmosphere must continue to ensure the safety of all Entrants. — Must see that continuous forced-air ventilation is used to control or eliminate hazards. — Ensure that pure oxygen is never used in ventilation (this dramatically increases the chance of fire or explosion). • Forced-air ventilation alone will not always protect entrants from toxic gases and vapors. — The Entry Permit may also require the use of a respirator or Self-Contained Breathing Apparatus. • "Hot Work" Permits must be issued for jobs that may produce a spark or flame, such as welding and riveting. — This can also cause caked-on residues to boil off, releasing toxic gases or vapors. • Following Lock-Out/Tag-Out procedures is also important. — All sources of energy must be cut off. — Heavy moving parts that could trap or crush a worker must be completely shut down. • In some instances, it may be impossible to lock out equipment because it is part of a vital service system. — If this is the case, other measures must be taken to ensure safety. • When the Entry Supervisor is certain that all potential dangers have been eliminated, they will sign the Entry Permit and work can begin. • During entry operations, the Entry Supervisor will clear all unauthorized personnel from the Permit Space area. — This keeps untrained workers from interfering. — Or others from being exposed to situations they are not prepared for. • The Supervisor will also ensure that operations stay within the guidelines set by the Permit. — If hazards develop at any time, work will be halted, and the Permit will be canceled. — Use ladders and other gear for safe entry and exit. — Set up safety barriers around entry points. — Use proper personal protective equipment. — They may also monitor the air inside the Space. — Set up forced-air ventilation systems. — Use explosion-proof lighting equipment in potentially flammable atmospheres. • In most cases, Entrants wear a chest or full body harness with a retrieval line. — This line can be attached at the center of the back near shoulder level... or above the head. — Wristlets may also be used, but only if it is not possible to wear a harness. — A fixed point outside the entrance. — Or a retrieval device such as a tripod and winch. — These systems must be used unless they increase the risk of injury or would be ineffective in a rescue attempt. • While inside a confined space, the Entrant must stay in constant communication with the Attendant in the event of an emergency. — This may require using two-way communication equipment, such as radios. — If so, the Entrant will receive training on how to use this equipment before entering the Space. — Undergo the same training as an Entrant. — Be prepared to handle other tasks, such as monitoring Entrants. — Assist with an Entrant's entry and exit. — Maintain communications with Entrants. • An Attendant may monitor more than one Entry Space at a time, and may also perform other tasks. — Such as handing tools down to Entrants. — These other tasks must never interfere with the Attendant's ability to watch out for problems and safely monitor all entry personnel. — Exposure to toxic substances. • During most entries, an Attendant will never enter the confined space... even to perform a rescue. — However, an Attendant may enter a space if specifically authorized by the Permit. — Will need to call for an evacuation. — Needs to know the exact number of Entrants in the space. (so everyone can be accounted for). — Using information written on the project's Entry Permit. — Knowing where to find Material Safety Data Sheets that may be needed by emergency personnel. • Many facilities are served by an outside rescue team. — Employers must inform the team about all potential rescue scenarios. — The rescue team must be given access to the facility's confined spaces for rescue planning and practice sessions. • Whenever a Permit Space is evacuated, an evaluation must be made to find out what went wrong. — Only after corrective steps have been taken can the space be re-entered. — A new Permit must be filled out and signed by the Entry Supervisor before re-entry can occur. • Remember, a Permit must be filled out whenever a space is going to be entered. — The Permit Form is set up by your facility, using the regulation as a guideline. — The space to be entered. — The purpose of the entry. — The date the entry is to be made. — The authorized duration of entry. — All hazards associated with the space. — The measures that need to be taken to isolate, control or eliminate hazards. — Required communication equipment, air monitors and alarm systems. — Personal protective equipment that should be worn in the space. • The Permit must also show the conditions that are necessary for safe entry into the Space, such as forced- air ventilation. — The results and times of initial and periodic testing must be recorded. — The authorized person doing the testing must initial the Permit. — The need for any additional work permits, such as "Hot Work", should also be shown. — The telephone numbers of local rescue squads, police and fire personnel. — A list of any emergency equipment that should be on hand. • The Entry Supervisor must sign the Entry Permit before work can begin. — A Permit is valid only until a condition arises which is not allowed, or until the project is completed. • Permits from completed jobs must be kept on file for at least one year. — This helps determine if any changes need to be made to the Permit Plan. — If any problems occurred during the entry, details should be recorded for future study. • There can be a number of differences in the way you approach each confined space. — The types of hazards that are encountered will determine the procedures to be followed. • Some Permit Spaces may require only a few safety precautions. — In some spaces, the only hazards are atmospheric. — If forced ventilation alone can control these hazards, additional precautions may not be needed. • In fact, an Entry Permit isn't always required to work in a confined space. — If it can be proven without entering a space that there are no hazards, it can be designated Non- Permit. — In these cases, work can be done without following the guidelines of a Permit-Required Entry Program (an Entrant can work alone without an Attendant). • Some Permit-Required Spaces can also be re-classified as Non-Permit, following the removal of hazards or potential hazards. — Written certification showing that all hazards have been eliminated is required for reclassification. • Sometimes a facility will bring in a contractor to work in confined spaces. — The facility must inform the contractor of the existence of Permit Spaces. — The contractor must also be informed of the hazards that make them Permit-Required. — The contractor must actively seek out this information before beginning work. — The contractor must also inform facility personnel as to what precautions they will be taking. • OSHA's Permit-Required Confined Space regulation is designed to provide the safest possible conditions for anyone working in or around a Confined Space. • But remember that you have responsibilities as well. — Take your training seriously. — Use extra precautions when working in or around Confined Spaces. — Wear appropriate Personal Protective Equipment. — Follow all specified procedures. • Most of all, take the time to become familiar with the Confined Space Regulation and your facility's Entry Permit System. — Your life and the lives of your coworkers could depend on it!